A local species with modern records throughout England and Wales north to Leeds including the Isle of Wight (NBN); there are many recent records along the eastern reaches of the Thames and so perhaps it is not surprising to find it in our Watford area. 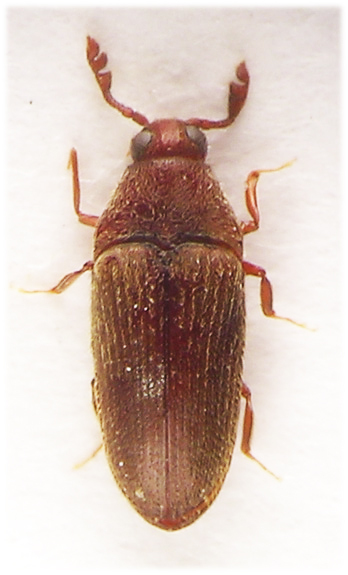 We have swept them from Fagus in Whippendell wood (August, 2008) and have observed them flying to an MV lamp situated beneath mature Fagus in a town centre garden during August and September (2008). Upon alighting, or in the sweep net, the adults lie still with appendages drawn into the body for some considerable time so resembling small seeds and are easily overlooked. Development probably lasts two years and takes place in the soil where the larvae feed on ectomycorhizal fungi (Hurka). N.B. The only throscid included on our saproxylic list (Alexander) is Aulonothroscus brevicollis (de Bonvouloir). 2.5-3.3mm. (Joy) Entirely brown to pitchy red with body pubescent, broadly elongate and widest at shoulders. Head sparsely punctured and very finely pubescent, broadest at eyes. Base finely bordered between posterior margins of eyes and temples with a fine curved line from top margin of eye to base. Antennae characteristic, inserted immediately in front of eyes. Mandibles prominent. Eyes deeply emarginate from front margin to at least two thirds the diameter 1. With a distinct longitudinal raised carina either side from vertex to front of clypeus (sometimes also with a central carina, Allen, 1968) these are situated nearer the inner margin of the eyes than from each other. Pronotum widest before backwardly produced hind angles and evenly tapering to a weakly sinuate front margin. Cuticle shiny with coarse punctures which are much larger than those on the head, weakly depressed inside hind angles, hind margin strongly sinuate. Pubescence backwardly recumbent on disc, obliquely so towards margins. Scutellum large and inset from front margin of elytra. Elytral striae punctate, weakly impressed at base becoming deeper and wider laterally and towards apex. Interstices flat; each with a row of punctures 1 which are as strong as, or a little stronger than, those within striae. Surface with dense, recumbent pubescence as well as a row of larger semi-erect setae along each interstice. Epipleurs strongly narrowed from base to level of hind margin of metasternum. Legs relatively long and slender. Meso and metatibiae with two rows of fine bristles on outer edge between which the tarsi lie whe the legs are retracted. Tarsi 5-5-5; first segment very long, fourth bilobed. 1 In T.dermestoides (L.), which is about the same size, the eyes are not so deeply emarginate; the 'notch' reaching only to about the middle, and the puncturation within the elytral interstices is much finer than that within the striae.